An elegant powering scheme accommodates the ILC’s new one-tunnel design. Though it doesn’t sound like a way to tidy up, the alliteratively named klystron cluster could be the mechanism that helps streamline the large-scale design of the ILC. Scientists at the SLAC National Accelerator Laboratory in the US are currently developing the klystron cluster scheme, a new kind of power-delivery system for radiofrequency cavities that distributes power from a common conduit. One substantial component, a ten-metre test section of pipe, has held up well under pressure and power. “It’s fairly exciting,” said SLAC’s Chris Adolphsen, who conceived of the scheme after a pivotal moment in the Global Design Effort’s (GDE) evaluation process that radically changed the collider blueprint. In an early incarnation of the ILC plan, scientists devised a design with two large underground tunnels: one for the beamline and one for the machinery that would power it, called the service tunnel. Then they started thinking outside the tunnel. To help reduce construction costs, they decided to eliminate the service tunnel. One way to do this would be to promote any device responsible for generating power from beneath the soil to the surface. 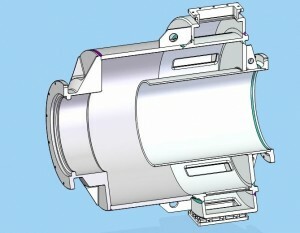 An alternative technique, which distributes power sources beside the main accelerator, is under development at KEK and elsewhere. These powering devices include klystrons, which generate the radiofrequency power needed to run the accelerating cavities. One klystron provides enough power for 26 cavities. The ILC calls for thousands of cavities and therefore hundreds of klystrons. If each above-ground klystron were stationed directly above its assigned underground cavity group, the ILC would require hundreds of 100-metre-deep holes to deliver power below ground. What’s more, the klystrons would take over the land, requiring long stretches of buildings along the ILC’s 31-kilometre length, like a tunnel relocated to the open air. So Adolphsen, who is in charge of main linac integration for the GDE, proposed that the klystrons be clustered – physically grouped together in tightly knit bundles of 33 klystrons each. Clusters can be paired up to share a building, with one cluster feeding cavities upstream and one feeding downstream. In this scheme, the klystrons are far less disruptive. Rather than being housed in a long, nearly continuous building, klystrons would be contained in a mere 22 compact structures spaced a vast two kilometres apart. Clustering klystrons means pooling power. Each of the 33 klystrons contributes ten megawatts of power through waveguides, hollow metal conduits of radiofrequency power. These rivulets of power feed into a much larger waveguide, or ‘the big pipe’ as it’s known around SLAC. That big pipe, now channeling about 300 megawatts of power, burrows its way beneath the ground until it reaches the beamline tunnel. Once there, the power is tapped off every 38 metres, travelling along smaller waveguides to reach the cavities. “It’s like you poured all your measuring cups into one big barrel, and as you go along, you put your measuring cup in and take that much off again locally,” said Nantista. The measuring cup for radio frequency power is called a coaxial tap-off, designed by Nantista. This aluminum joint, which connects larger waveguides with smaller ones, is essentially a pipe within a pipe, forming a cross-section with an inner circle and an outer ring. The tap-off skims off a portion of the power coming from the big waveguide. That skimmed off power passes through the outer ring of the tap-off to a group of 26 cavities. The remaining power travels down the inner region of the tap-off until it meets the next one, which then also channels power to its designated cavities. As power is fed to each cavity group, the pool of power from the klystron cluster diminishes until it is all used up. Then the next klystron cluster takes over. Computer simulations and initial tests for the coaxial tap-off look promising. “It turns out to be useful,” said Nantista of his design. The dimensions of the coaxial tap-off have to be precise to ensure that the right amount of power travels down the tap-off and that no other undesired wave patterns are propagated down the tube. 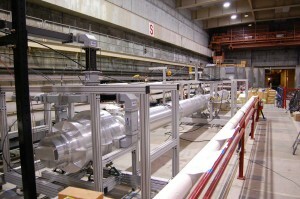 For the same reason, the diameter of the big pipe, as wide as a nice-sized computer monitor, has to be accurate to within about a millimetre. That’s not the only challenge of the big pipe. It has to handle power equivalent to that in some solar or wind energy plants. Tests held at SLAC over the past two months have given the team cause for optimism. “We’ve run power through the pipe for over 100 hours with only a few breakdowns,” said Adolphsen. That result not only allows scientists to characterise the pipe, but assures them that this large waveguide is a viable option for the above-ground cluster scheme. “The klystron cluster leaves you with a streamlined tunnel,” said Adolphsen. “When you go down there into the ILC tunnel, there’s not a whole lot to see.” And that’s the whole idea.